Returning to Fiji is is like being welcomed back to Paradise for Jason Cooper and his family. Malolo is gorgeous. Don’t just take our word for it. Go and find out for yourself. Picture: Supplied. The last time I holidayed in Fiji was as a family of three – travelling with my wife Karen and then 7-month-old daughter Ashley – and it was a blast! We made the decision to return this year, now as a family of four, with the addition of our almost 5-year-old daughter, Roxy. Ashley, now 7, has no memories of her first holiday here except for her mum and dad’s holiday snaps, so we are very excited to show her this beautiful place again. 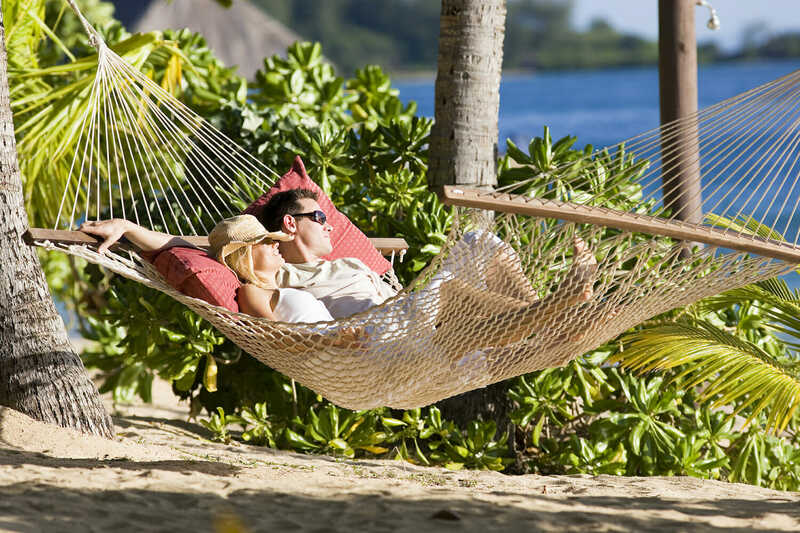 Our destination for seven days is Malolo Island Resort in the glorious Mamanuca Islands, but first we experience a night at the 5-star Sofitel Fiji Resort & Spa at Denarau, on the main island of Viti Levu. Our room’s windows offer a direct view of the inviting and awesome waterslide – the two little ones definitely know where they want to hang out. Despite the resort’s beachfront position – and our 5am wake-up before our flight from Sydney – the girls make it clear there is absolutely no time to waste, and it is a case of “cozzies on, pronto, and straight to the pool”. By dinnertime we are all happily relaxed, seated at a beachfront table watching the sunset. The kids play in nearby hammocks, before heartily tucking into spaghetti and fish and chips. The restaurant isn’t short on ambience or good food. Picture: Supplied. Departing Port Denarau Marina the next morning for a one-hour ferry trip to Malolo Island Resort does not preclude an early morning pool swim at the hotel before we bid farewell – yes, our two excited young girls are insistent. “Fiji is fun, isn’t it dad?” Roxy says. 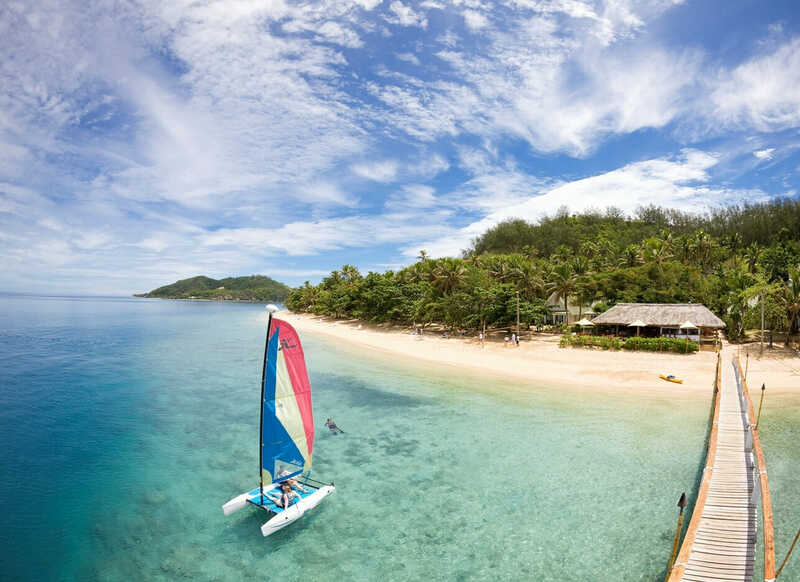 The aptly named, family-friendly Malolo Island Resort is located on Malolo Island and is part of the Ahura Resorts, a 100 per cent Fijian-owned company whose other property is the adults-only Likuliku Resort, also on Malolo Island, and the first resort with overwater bungalows in Fiji. Family owned and committed to sustainable tourism, Ahura Resorts has an active membership of the Mamanuca Environment Society (MES) that provides resort staff training and guest education to ensure the preservation of the environment. MES is also involved in preservation projects, including coral transplanting and turtle conservation and – unique to their resorts – a special project involving very rare Fijian iguana! Getting to know the amazing, caring and amiable resort staff begins early in our holiday – with Jesse, who is in charge of safely transporting us in the tender from the ferry to the resort. It doesn’t take us long to feel like Malolo family. Over the next few days we make friends with many of the staff, such as Bill, our resident gardener, who teaches us to say “ni sa yadra’, which means good morning; Tila, who helps Ashley make an amazing grass skirt for the Saturday night dance; Pita, the friendly host at the adults-only bar and pool (who makes a great cocktail); and Andy, who the kids love and who makes great coffee at the Beach Bar. We also make some new friends from Queensland – James and Debbie – who have a love affair with espresso martinis. 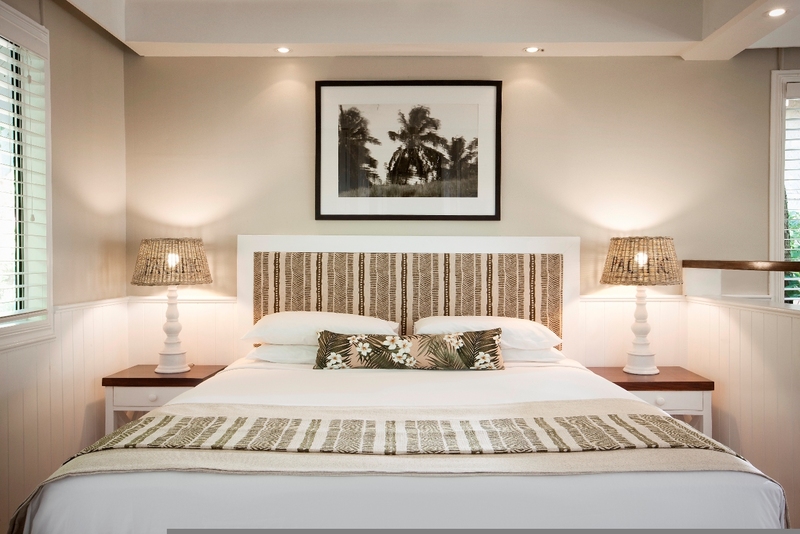 Home for us on Malolo is a relaxing open plan bure with a cosy balcony. A queen-sized bed, and a lounge that is turned down to become beds for the girls every night, makes for very comfortable family holiday digs. Soft and welcoming, just like Fiji. Picture: Supplied. Day one at Malolo Island Resort is surprisingly pleasant, given our girls’ timetables begin on ‘Fiji Time’, so we saunter off late morning to a lovely and leisurely buffet breakfast. Breakfast is plentiful, and I know I will really miss the omelettes once I return home. Some days the girls head to Tia’s Treehouse kids’ club. Roxy is always up early in the morning, keen to get ready and off to kids’ club, with Ashley not far behind her. The varied activities keep children of all ages and interests entertained, and we are very impressed with our girls’ skills, weaving baskets from coconut palm leaves! Every night the kids have dinner at kids’ club, so us adults can spend time with Pita at the cocktail bar, followed by dinner at the adults-only restaurant, which constantly impressed us with its quality. On other days we choose to adventure as a family. From the Beach Bar there are great views of Wadigi Island, owned by the Johnston family from Queensland. 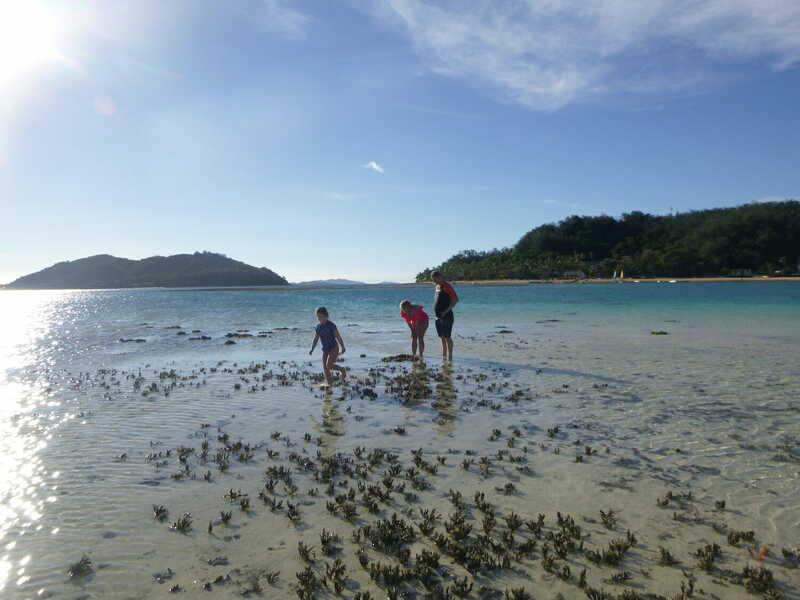 Between Malolo Island and Wadigi is another small island with an exposed reef at high tide, and this is the perfect place for kayaking out with the kids to snorkel safely and explore the colourful reef and abundant fish life. You could be active…or not. Picture: Supplied. 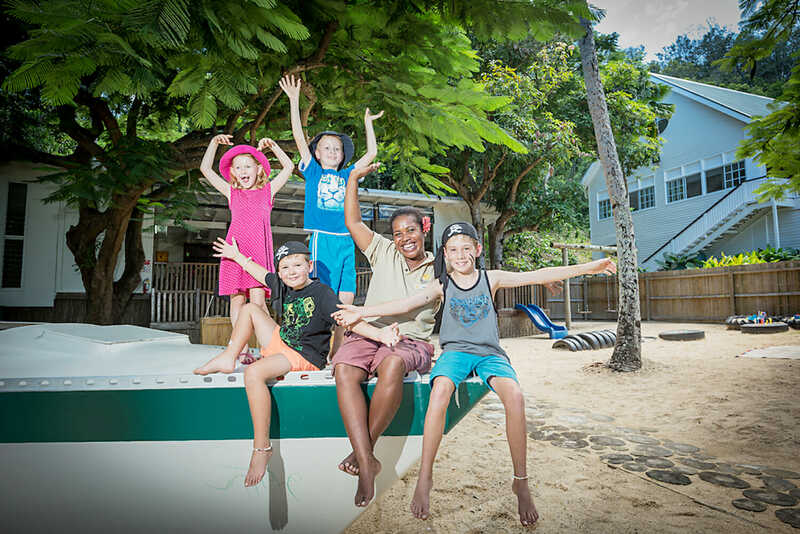 The kids have no shortage of fun, free activities on offer – stand-up paddleboards, kayaks and snorkelling gear are all available. Each day we head for the water to experience the beautiful little reef and its hidden treasures. Karen and I take turns looking after the kids in the water, having their own fun. We all build up a good appetite for lunch, which we usually enjoy at the Beach Bar. The chicken ‘wing dings’ are a treat and the pizzas are delicious – we always end up ordering so much food we can barely move after lunch! In the afternoons, the girls go to kids’ club to enjoy more activities – everything from coconut and watermelon-cracking to games such as ‘Crocodile, crocodile, can I cross the river?’. The club certainly keeps them entertained and it is easy to get the kids into bed at night as they are so tired and quickly drift off to sleep. Remember the iguana project mentioned earlier? The resort became involved when, in 2011, three rare juvenile Fiji Crested Iguanas were discovered on its grounds. Listed on the endangered list (IUCN 2006), the discovery, understandably, was heralded as a major find – both in Fiji and internationally – and led to the establishment of a captive breeding facility that now hosts four pairs of the iguana and is aided by specialists from Taronga Zoo in Sydney and San Diego Zoo in the USA. It’s no small achievement, and Ahura Resorts’ Sia is a commendable ambassador promoting the value and significance of the breeding program. She does an excellent job presenting this amazing story to Malolo guests and it is a real treat for Ashley and Zoe to learn about these creatures. The staff love kids and teach them all about Fiji. Picture: Supplied. A real treat for Dad, however, is a three-hour jet ski safari to Fiji’s world-renowned surf spot Cloudbreak. Surfboards can be hired from the Funky Fish Beach and Surf Resort. And with Jonah’s expertise to guide us on the safari, I’m sure all on board will be reliving this dream experience long after their last wave. I’m an average surfer and had an awesome time, with enough energy leftover to go snorkelling afterwards (my tip: take plenty of water). At the end of our stay we are sad to leave. Incredible people, stunning location, fabulous food and relaxation in abundance… it is with heavy hearts that the four of us bid our farewells to Malolo Island Resort and our new friends. We will be back. We will miss pottering about on a gorgeous beach. Picture: Supplied. Fiji is the perfect destination all year round; however, May to October is perfect for snorkelling as the water is nice and clear. November to March is Fiji’s wet season so expect daily rain showers and a chance of a hurricane, but these months will also provide the best travel deals and water that is the perfect temperature. Which South Pacific island is right for your family?